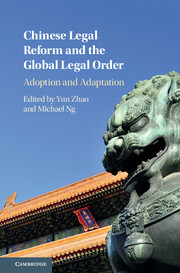 "Chinese Legal Reform and the Global Legal Order: Adoption and Adaptation"
Description: This volume critically evaluates the latest legal reform of China, covering major areas such as trade and securities law, online privacy law, criminal law, human rights and international law. It represents a bold departure from the most recent works on Chinese legal reform by engaging the ideas of experts in contemporary Chinese law with the archival scholarship of Chinese legal historians. This unique interdisciplinary feature affords readers a more nuanced view of the complexities and specificities of how China has problematised legal reforms in various historical contexts when building a progressive yet sustainable legal system. This volume appraises the most current reform in Chinese law by considering China's engagement with globalisation, increasingly complicated domestic situation and historical legal transplantation experiences. It will be of huge interest to students, researchers and practitioners interested in Chinese law and policy, China and Asian studies and Chinese legal history.